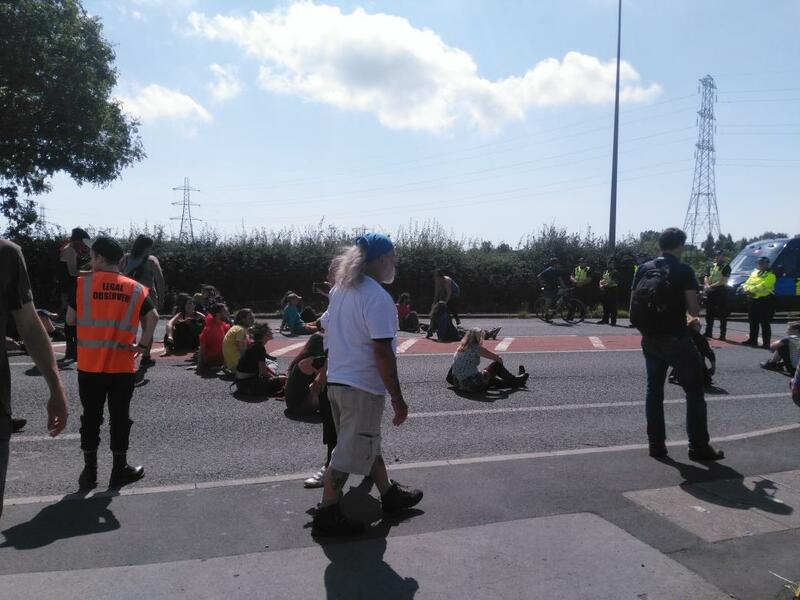 This recent statement is an excellent summary of the current situation as regards the on-going protests against fracking at Preston New Road (PNR). 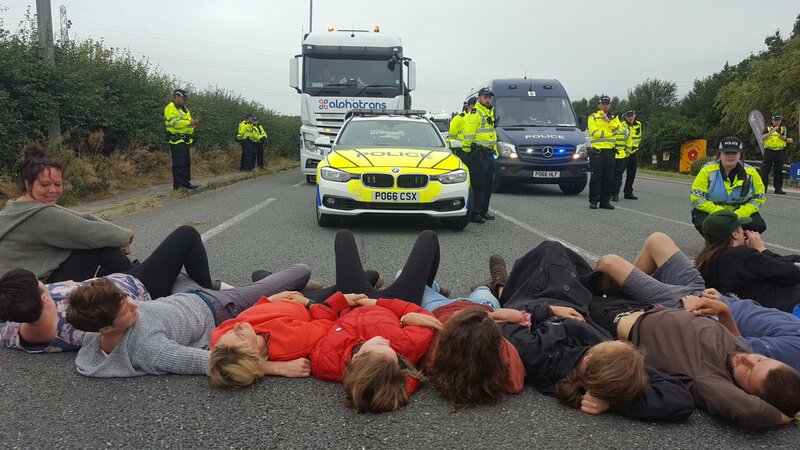 This fracking site - operated by dirty-energy company Cuadrilla - has seen daily protests ever since work began in January. As a result, Cuadrilla’s fracking project is approximately 5 months behind schedule. 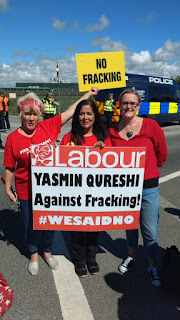 In June 2015, Lancashire County Council rejected both of Cuadrilla’s fracking applications. Yet, in October 2016, this was overturned by the Tory government - despite ‘promises’, before the 2015 general election, to leave such matters to local councils. 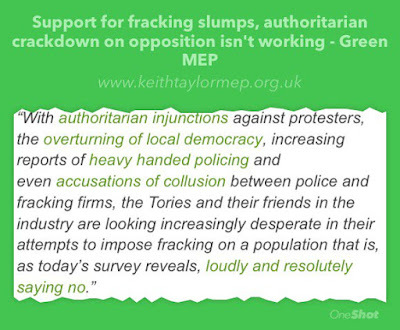 There is, however, an even greater threat to local democracy: although shelved following the Tories’ poor performance in this year’s general election, the Tories wish to place fracking under ‘Permitted Development’. 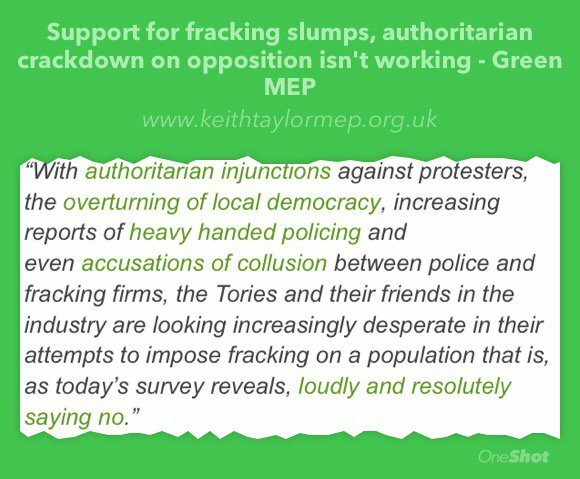 This would grant automatic approval without any scrutiny by democratically-elected local councils. In May’s local elections, Lancashire County Council passed from Labour to Conservative control. 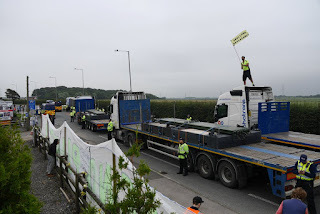 Previously, the planning permissions and regulations imposed on Cuadrilla included a prohibition on moving heavy lorries, to or from the site, between 6.30pm and 7.00am. 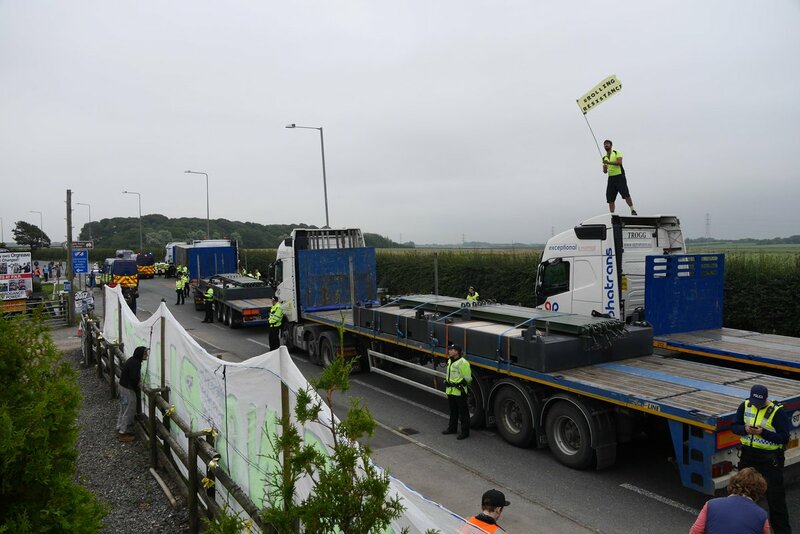 Yet, when Cuadrilla recently broke that prohibition, by bringing in 30 lorries at 4.15am, the new Conservative-controlled Council’s response was… to write a letter to Cuadrilla, noting their disappointment! 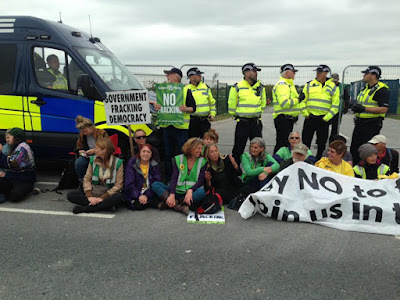 The central part of the peaceful sit-down on Monday 21 Aug. - Gina Dowding (Lancashire County Councillor) & Tina Rothery (Anti-Fracking Nana) are centre-frame. Once two polite verbal requests to move had been turned down, the police made no effort to move people physically. As a result of this - and a 5-person lock-on in the morning - only one HGV lorry was able to enter the site all day! However, when numbers are low, the various protest actions are often met with what can be described as, at best, ‘robust’ policing. At times, this has included violently shoving protesters into hedges/fences, or throwing them to the ground - and even tipping people out of wheelchairs. As a result, there has been a considerable number of official complaints. During July, Reclaim the Power organised an entire month of varied protests, known as Rolling Resistance. As well as tried-and tested methods like sit-downs and lay-downs. In order to maintain the momentum RTP has built up, local Green Parties, and Greenpeace and FoE groups, have combined together to organise regular ‘Green Mondays’ in an effort to get high numbers for one day a week, for the next couple of months at least. 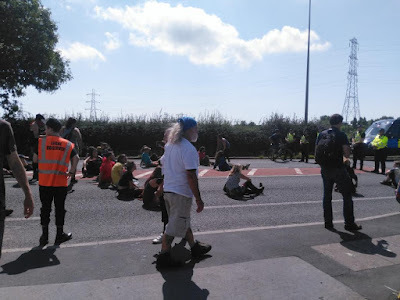 On 14 Aug., Natalie Bennett came up to PNR and, on 21 Aug., Jamie Peters (FoE’s Anti-fracking Organiser) was the main speaker - the latter day culminating in the successful sit-down. So far, numbers have slowly picked up on each of these successive ‘Green Mondays’. and she and her Office Manager are currently doing what they can do to promote the idea of a weekly ‘Red Day’. Tuesday 29 August: Sail Away Day! - because of Bank Holiday Monday, the ‘Green Mondays’ emphasis has been shifted to Tues. 29 Aug. The day has a ‘sailing theme’ - so if you’re coming, it would be great if you wore something vaguely nautical! Friday 1 September: Mass Action/Funday!! - with family-friendly activities. Monday 4 September: Amelia Womack (Green Party Deputy Leader) will be the main speaker - and there is the possibility (not yet confirmed) that there will also be a national Greenpeace speaker. Monday 18 September: Caroline Lucas will be the main speaker; one of the other speakers will be Stephen Hall - president of Greater Manchester Assoc. of TUs, & Chair of Unite the Union/GM Area Activists' Cttee - who will be speaking about the One Million Climate Jobs campaign. 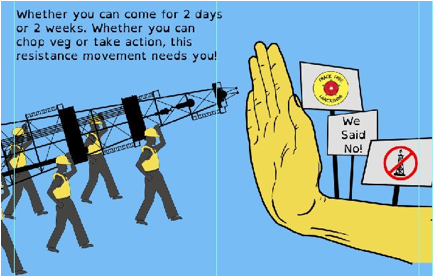 Friday 29 September: Stephen Hall & Ian Hodson (President of the Bakers, Food & Allied Workers' Union - the first union to come out against fracking) are organising what should be a 'big NW Trade Unions’ mobilisation'. (a) Come & join us! The main thing people can do to help is, quite simply, to come to PNR for these ‘Green Mondays’ - or other days, if Mondays are difficult - as often as they can! Ideally, we want to reach that ‘Magic Number of 100’ on as many days as we can. With numbers like that, the police often decide that no safe deliveries can be made to the site at that time! Another way of helping is to share information about these protests, with family, friends and organisations, as widely as possible. The more people know what’s happening at PNR, the more likely we are to get high numbers of protesters. Potential protesters need to know that there are many different roles they can play: from helping to prepare food for the protesters, to simply standing with placards on the pavement across from the site, to various forms of peaceful civil disobedience/ non-violent direct action (nvda) - (e.g. sit-down protests, lock-ons, and 'truck surfing'). It is ENTIRELY up to individuals to decide which type of activity they wish to take part in. If nvda is not for you, that doesn’t matter at all - what DOES matter is getting as many people as possible attending each and every day. Simply being there gives real moral support to those who have been protesting since Cuadrilla’s activities on this site began in January. And passing drivers seeing large numbers standing on the pavement with placards is a great way of increasing public awareness of the campaign - sometimes, there are so many drivers ‘honking’ their support that it gets quite noisy! • For those using public transport, the nearest station is Kirkham-and-Wesham: from there, cross over the road and catch the #61 bus, which takes about 15 minutes. There is a bus stop very close to the fracking site. Alternatively, you could take a bike and cycle from Kirkham-and-Wesham station, which also takes about 15 minutes. Come off the M55 @ Jnc 4, onto the A583, signed Preston/Kirkham. Tel: 01772- 685166. The farm is less than a 20-minute walk from the fracking site. The World of Water Aquatic Centre has also kindly agreed to allow protesters to park at the very far side of their unmade (& often water-logged!) back car park. If you are parking there, PLEASE make sure you leave the car park BEFORE 6.00pm. 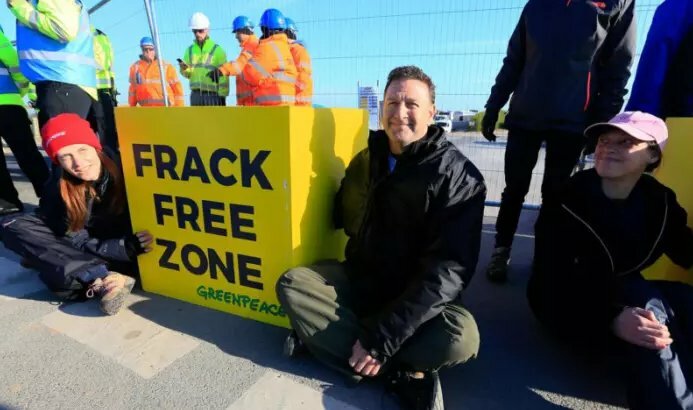 • For those travelling by car who have health/mobility issues, it is possible to be dropped off at the fracking site itself. • Toilet facilities: there are portacabin toilet facilities at Maple Farm Nursery Garden - and 'proper' toilets at the World of Water Aquatic Centre. However, you should be willing to buy drinks and/or food at Ma Baker's café/restaurant, which serves hot drinks and food (including 'an amazing selection of cakes'! ), rather than just wandering in and out to use their facilities. They have been very good to us - despite our protests sometimes causing temporary road closures - so we wouldn't want protesters to take them for granted. • For those staying several days, the owner of Maple Farm has also made space available for camping. In addition, there are two other campsites. For those who (like me!) prefer more comfort, there is a Premier Inn on the roundabout as you come off the M55 - and it’s only a 30-minute walk to the fracking site. • Free vegan/vegetarian food and drink are provided for protesters (donations welcomed from those not unemployed or on benefits). Please indicate on this when you'll be attending, so we get some idea of numbers for each Monday. We - and your planet - need YOU! !